See Below how to create DJ Accounts that you can give out to users that will connect to your stream. The DJ manager allows you to create and configure DJ accounts allowing your station’s DJs to have limited access to the features of your control panel. Once an account has been created for a DJ, the DJ can log in with his DJ account’s username and password using the same login form URL you use to access Centova Cast. 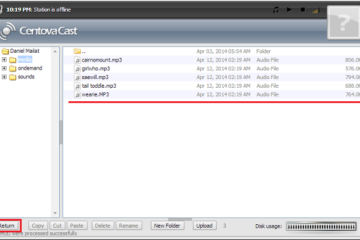 For SHOUTcast DNAS v2 servers, DJ accounts can also be used to perform live broadcasts. The DJ account’s username and password become the source username and password for connecting to sc_trans v2. The DJ Management page may be accessed using the DJs link under the Configuration heading in the navigation menu. To create a new DJ account, click the Create DJ Account link in the upper, right-hand corner of the page. This will launch the DJ account editor, described under DJ Account Editor below. To edit an existing DJ account, click the Edit DJ Account icon next to the DJ account you wish to edit. This will launch the DJ account editor, described under DJ Account Editor below. To delete an existing DJ Account, click the Delete DJ Account icon next to the DJ account you wish to delete. This will permanently remove the DJ Account. To enable or disable an existing DJ account, click the Enable DJ Account icon next to the DJ account you wish to delete. A disabled DJ account will be prohibited from logging in. Username Specifies the username for this DJ account. This will be used by the DJ to log in. Password Specifies the password for this DJ account. This will be used by the DJ to log in. Real name Specifies the real name for the DJ. This is informational only and is not used internally by Centova Cast. Status Specifies the status for the DJ account. If a DJ account is Disabled, the DJ cannot log in. Allows the DJ to start or stop the streaming server. Allows the DJ to start or stop the autoDJ only. Allows the DJ to modify the autoDJ’s playlists. This controls the DJ’s access to the playlist settings only; see the Access media library permission below to control access to playlist track management. Allows the DJ to access the media library and add/remove tracks to/from playlists. 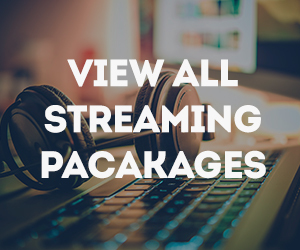 Allows the DJ to access the file manager and upload, move, rename, delete, and otherwise manipulate the files for your stream. Allows the DJ to use his username and password to log in via FTP and access all files for your stream. Also implicitly grants the Manage media files permission above to allow the same privileges via the file manager. Provides a private folder under media/dj/djusername/ in which the DJ can upload and manage his own private set of media files via FTP or via the file manager. Files uploaded to this private folder are automatically added to the media library per usual. The DJ cannot view or manipulate any files outside of his private directory. Allows the DJ to view the statistics for the stream. Allows the DJ to view the current listeners for the stream. Allows the DJ to view the log files for the stream. Allow logins Specifies the days of the week on which the DJ is allowed to log in. If no days are selected, the DJ will not be permitted to log in. 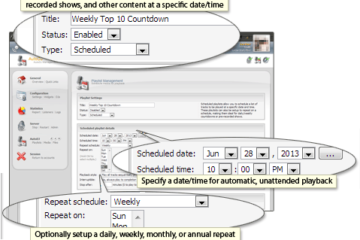 Allow from Specifies the earliest time of day at which the DJ is allowed to log in. Allow until Specifies the latest time of day at which the DJ is allowed to log in. Very important that you RESTART the SERVER STREAM after you create each DJ for the login to take effect.